Members of the Friends of the Roanoke County Public Library (FOL) organization are people who believe a strong public library is essential to Roanoke Valley, contribute their support to achieve this goal, and work for a cause important to them and to their community. Anyone who believes in the value of libraries can belong to Friends of the Library. Dues cost $15 a year for an individual or $20 a year for a family. The FOL organization is classified as a 501 (c) (3) in accordance with the U.S. Tax Code. Generally, your membership contribution in FOL is tax deductible, but there are exceptions when the full amount is not tax deductible such as when the contributor receives some type of benefit. Please refer to IRS Publication 526 to determine what part of your contribution may not be eligible. If you are still unsure, it is recommended that you contact a tax advisor or the IRS by telephone. 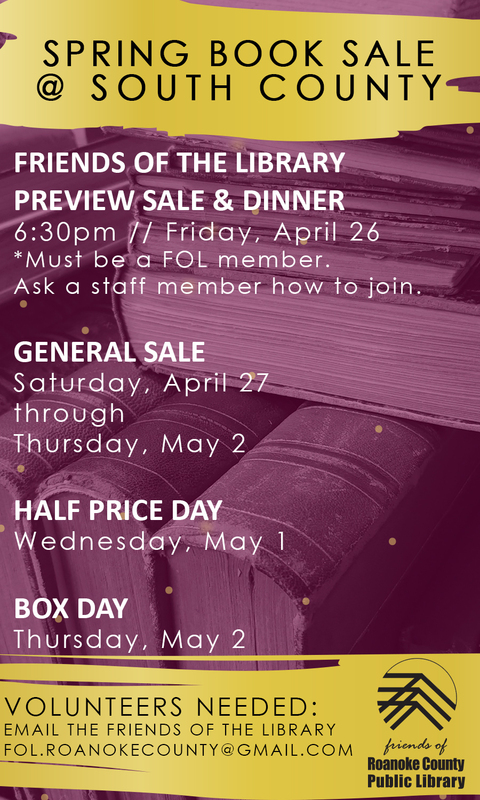 Members of the Friends can enjoy a dinner and preview the sale before it is open to the general public. Email Caitlin Gills to RSVP. Renewals and New Memberships will be taken at the door. The event begins at 6:30pm. Current members that are up to date on their membership should have received an invitation in the mail. By volunteering your time at the sale, you are supporting the library system and it's programs and services for the community throughout the year! Any volunteers 13 years and older can help without a parent/guardian present. Any volunteers 12 years and younger must have a parent/guardian with them at all times! Any volunteer earns $5 in "book credit" to use on any items during the sale for every 3 hours they help! Snacks and drinks will be provided for all volunteers as well.